The company announces a 12% dividend increase; its 53rd consecutive annual increase. 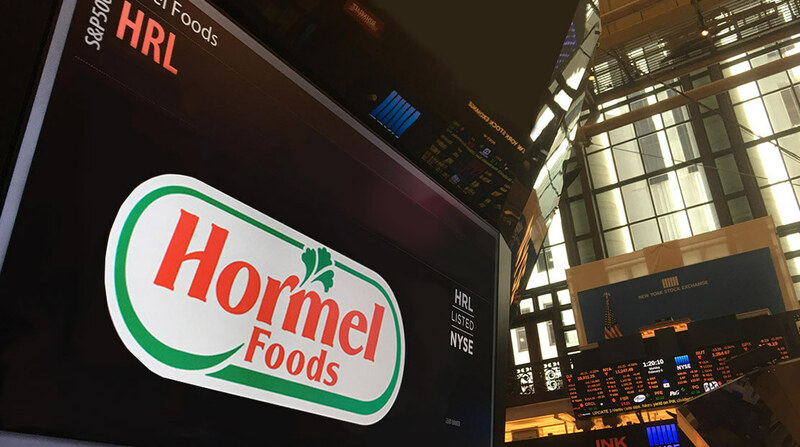 Hormel Foods Corporation (NYSE: HRL), a leading global branded food company, today reported results for the fourth quarter of fiscal 2018. All comparisons are to the fourth quarter of fiscal 2017 unless otherwise noted. The following items are included in the company’s guidance range. The company plans to deliver $75 million in cost reductions in 2019 which excludes any planned synergies from recent acquisitions. The company will use the savings to help offset inflation, reinvest into key brands, and contribute to earnings growth. The company also expects to complete the Fremont divestiture in December 2018, incurring approximately $12 million in expenses. This transaction reduces earnings volatility and decreases the company’s reliance on commodity profits. Effective November 15, 2018, the company paid its 361st consecutive quarterly dividend at the annual rate of $0.75 per share. Sales increases were driven by branded products such as Hormel® pepperoni, Hormel® Natural Choice® products, Applegate® natural and organic products, and Austin Blues® authentic barbeque products in addition to the benefit from the Columbus and Fontanini acquisitions. Organic volume and sales decreased due to lower hog harvest levels. Segment profit increased 25% in spite of a 31% decline in commodity profits and a double-digit increase in freight expenses. Volume and sales growth of Herdez® salsa and Wholly Guacamole® dips did not offset declines in our contract manufacturing business. Adjusted segment profit1 decreased due to a decline in sales and higher freight expenses. Additionally, a non-cash impairment of $17 million was incurred in the fourth quarter associated with the CytoSport business. Volume and sales decreases were due to lower whole bird volume and sales as shipments were shifted into the prior quarter to minimize cold storage expenses. Jennie-O® premium deli products and Jennie-O® foodservice products delivered sales gains. Segment profit decreased as a result of lower whole bird sales, higher feed costs, and increased freight expenses. Volume and sales increased as higher exports of SPAM® luncheon meat and Skippy® peanut butter and the addition of the Ceratti business were partially offset by lower fresh pork exports. Global trade uncertainty continued to negatively impact fresh pork export volume, sales, and profitability. Segment profit increases were driven by the addition of the Ceratti business and lower selling, general, and administrative expenses. Selling, general and administrative expenses for the full year increased due to acquisitions and higher advertising investments. Advertising investments for the full year were $152 million compared to $136 million last year. Operating margin for the full year was 12.6% compared to 14.0%. The decline was primarily related to lower whole bird profitability. The full year effective tax rate was 14.3% compared to 33.7% last year. The decline was due to The Tax Cuts and Jobs Act passed in December 2017. The effective tax rate for fiscal 2019 is expected to be between 20.5% and 23.0%. Cash flow from operations for the full year was $1.24 billion, up 20% compared to last year. The increase was primarily due to by a lower tax rate and improvements in working capital. Share repurchases for the full year total $47 million, representing 1.4 million shares purchased. The company repaid $375 million in short-term debt in the full year. The company paid its 361st consecutive quarterly dividend at the annual rate of $0.75 per share, a 10% increase over the prior year. Capital expenditures for the full year were $390 million. Capital expenditures for fiscal 2019 are expected to be approximately $350 million. Large projects in 2019 include the Burke pizza toppings plant expansion, a Fontanini manufacturing line, and many other projects to support growth of branded value-added products. Depreciation and amortization expense for the full year was $162 million. Depreciation and amortization expense for fiscal 2019 is expected to be approximately $175 million. After the acquisition of Columbus Craft Meats, the largest in the company’s history at $857 million, the company remains in a strong financial position with its low level of debt and consistent cash flows. Cash on hand increased to $459 million from $444 million at the beginning of the year. Total long-term debt is $625 million compared to $250 million at the beginning of the year. Working capital decreased to $911 million from $968 million at the beginning of the year, primarily related higher accounts payable and lower accounts receivable. A conference call will be webcast at 8:00 a.m. CT on Tuesday, November 20, 2018. Access is available at www.hormelfoods.com and clicking on “Investors.” The call will also be available via telephone by dialing 888-254-3590 and providing the access code 9962477. An audio replay is available by going to www.hormelfoods.com. The webcast replay will be available at 11:00 a.m. CT, Tuesday, November 20, 2018, and will remain on the website for one year. The non-GAAP adjusted financial measurements of organic net sales, organic volume, adjusted earnings per share, and adjusted segment profit are presented to provide investors additional information to facilitate the comparison of past and present operations. The company believes these non-GAAP financial measurements provide useful information to investors because they are the measurements used to evaluate performance on a comparable year-over-year basis. Non-GAAP measurements are not intended to be a substitute for U.S. GAAP measurements in analyzing financial performance. These non-GAAP measurements are not in accordance with generally accepted accounting principles and may be different from non-GAAP measures used by other companies. Organic net sales and organic volume are defined as net sales and volume excluding the impact of acquisitions and divestitures. Organic net sales and organic volume exclude the impacts of the acquisition of Columbus Craft Meats (November 2017), the acquisition of Fontanini Italian Meats and Sausages (August 2017), and the divestiture of Farmer John (January 2017) in Refrigerated Foods and the acquisition of Ceratti (August 2017) in International. Adjusted segment profit and adjusted earnings per share exclude the impact of a non-cash impairment charge associated with the CytoSport business which was recognized in the Grocery Products segment. The tables below show the calculations to reconcile from the non-GAAP adjusted measures to the GAAP measures in the fourth quarter and fourth quarter and full year of fiscal 2018. The effective tax rate was used to determine the tax effect of the impairment.